Hartlepool's independent mayor Stuart Drummond, formerly H'Angus the Monkey, mascot of the town's football team, has won a second term in office. But Labour won the other three mayoral contests, in Doncaster, Stoke-on-Trent, and North Tyneside. Conservatives have gained control of five county councils in England while the Lib Dems gained three. The unitary authority of Isle of Wight is also a Tory win. Stockton-on-Tees and Bristol have no overall control. In Hartlepool Mr Drummond came more than 10,000 votes ahead of the Labour Party candidate for mayor, Carl Richardson, in the second count. But Labour won all the other three mayoral votes. At Stoke-on-Trent, Labour's Mark Meredith defeated the previous incumbent Mike Wolfe, who won in 2002 under the banner of Mayor-4-Stoke. The margin was closer at North Tyneside, where Labour's John Harrison beat Conservative candidate Linda Arkley by 1,002 votes. At Doncaster, Labour's Martin Winter was returned after a hard fought battle with independent Michael Maye. In the local elections in England, the Conservatives remain by far the largest force, with control of 24 county and unitary councils. With final results in from 36 out of 37 county and unitary councils, the Conservatives have gained five county councils in the south and Midlands which had been previously under no overall control. They have taken control of Gloucestershire, Oxfordshire, Shropshire, Suffolk, Worcestershire and Northamptonshire, making a net gain of 153 councillors. Essex was the last county council to declare on Saturday, with the Conservatives increasing their grip on the authority by winning four extra seats. The Tories also took the unitary authority of Isle of Wight, with a net gain of 22 seats to win overall control, at the expense largely of the Lib Dems, who lost 14 seats. And they took control at another unitary council, West Berkshire, after gaining a Lib Dem seat at a by-election. But the Liberal Democrats, who did not previously control any councils, have so far gained three county councils which were under no overall control - Devon, Cornwall and Somerset. Meanwhile, Labour has retained control of its six county councils in the north and Midlands, but lost 109 councillors across England. Hampshire is the only council still to declare its result. 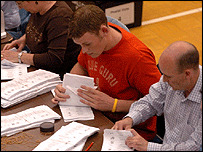 The last results in the county will be recounted on Monday.